Contemporary Greece stands at the precipice as it recovers from the 2008 currency crisis. The Syrian Civil War has placed Greece as an entry point into Europe. Geopolitics and economic chaos have turned the birthplace of democracy into a stereotype and a punchline. From this torturous situation has arisen a vibrant poetry scene. 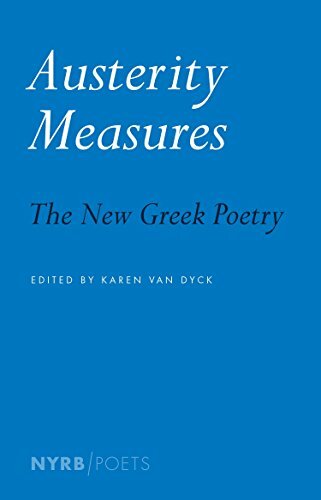 Austerity Measures: The New Greek Poetry, edited by Karen Van Dyck, attempts to capture the vitality, energy, and talent within the Greek-language poetry scene. I spit rhymes at 120 B.P.M. I am not like the rest of you. Stiggas’s work has been translated into many languages. His work shows influence of Paul Celan and the Greek poet Katerina Anghelaki-Rooke. Stiggas and others are in the first section of Austerity Measures called “Tradition and the Individual Talent.” The poets included in this section are older and more established. The poetry radiates with a classical coolness. Refined and polished, these poems rise above the political and economic chaos engulfing the region. Other sections focus on poets in the DIY and online scenes. Some whose work has never appeared in print! In other sections, Van Dyck selects poets who work across different media and poets in the outer provinces. Each section has a small explanatory paragraph laying out the criteria for selection. The editorial choices can at times feel arbitrary, but when arranging an anthology of such scope cuts will need to be made. Beyond the obligatory index of first lines, Van Dyck has included sections for further reading and detailed biographies of the translators. Despite whatever inevitable shortcomings occur with a project of this magnitude, New York Review Books Poets has assembled a top-notch volume. This is the anthology to start with. Karl Wolff is currently the Staff Writer/Associate Editor for the Chicago Center for Literature and Photography. In 2013 CCLaP released his book, On Being Human, an exploration of the question, “What does it mean to be human?” investigating the question by looking at various pop cultural artifacts from science fiction dystopias to Beckett novels to roleplaying games.